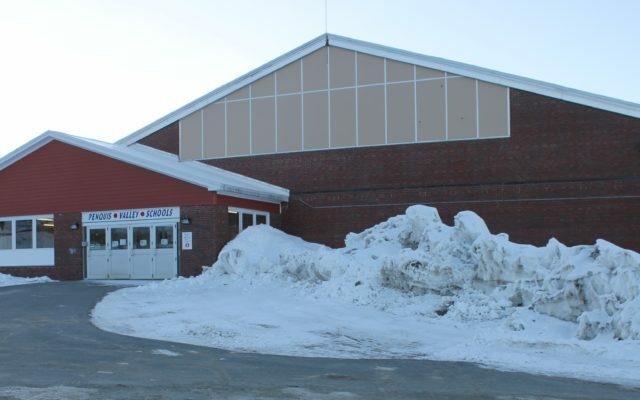 The Three Rivers Community (TRC) is a group of towns in the Maine Highlands with a total population of about 6,000: Atkinson, Bowerbank, Brownville, LaGrange, Lake View, Medford, Milo, and Sebec. TRC links our communities, businesses, & organizations together online for better social and economic progress. TRC was founded over 20 years ago, and has grown in many directions to suit the needs of our communities. We have local news, a community calendar, local government, local organizations, community event information, a local directory, and over 20 live local webcams! BANGOR — A 23-year-old LaGrange man who stole two separate vehicles last spring — a Dexter police cruiser and a Toyota Celica belonging to a veteran of the Iraq War — and led authorities on a high-speed chase that ended when he crashed the Celica will serve five years of a 10-year sentence. Appearing at the Penobscot Judicial Center on March 21, Tyler Tibbetts pleaded guilty to a half-dozen felony charges, including one that stemmed from an unrelated case in which he stole a vehicle in January 2018. Besides his incarceration, Tibbetts faces three years of probation in connection with the May 11, 2018, chase and was ordered to pay $3,000 in restitution to the owner of the Toyota Celica that he stole and crashed after driving over police spikes. He was sentenced to an additional fourth year of probation for earlier criminal charges. Judge John Lucy handed down that sentence after it was recommended by District Attorney Marianne Lynch, the lead prosecutor for Piscataquis and Penobscot counties. The owner of the stolen Toyota Celica attended the sentencing. He didn’t speak before the court, but provided a victim impact statement that Lynch read. In the statement, the owner said that he saved up to buy the Celica while serving in Iraq and that the car had helped him deal with the “aftermath” of his deployment. The owner also said that when he was younger, he got in trouble with the law after being involved in a high-speed car chase — before he enlisted in the U.S. Air Force — and told Tibbetts that he still had the option to make himself a better person. After the sentencing, the owner declined to talk with a reporter. The two most serious charges to which Tibbetts pleaded guilty were Class B felonies: escape and theft by unauthorized taking. 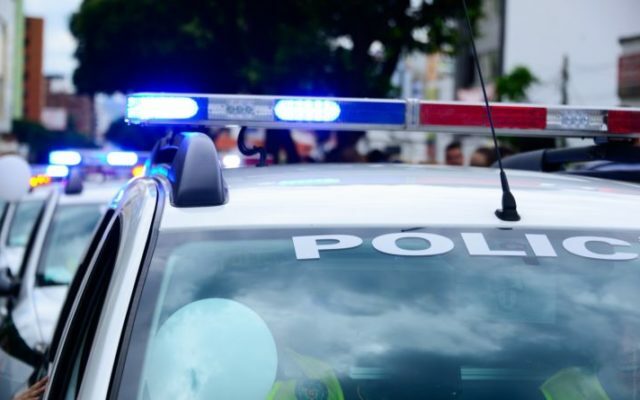 The four other charges were less serious Class C felonies: two counts of theft and single counts of eluding an officer and reckless conduct with a dangerous weapon. Tibbetts also pleaded no contest to a Class C count of possession of a firearm by a prohibited person, which was related to an AR-15 rifle that was in the police cruiser he stole, according to Lynch. During the proceeding, Harrow said that Tibbetts was not aware the weapon was in the cruiser. Lynch mentioned several factors in her sentencing recommendation, including that Tibbetts endangered members of the public and law enforcement. She also chose to dismiss other charges that had originally been filed against him. COSTA RICA EXPLORERS — Penquis Valley High School students, from left, Sydney Fowles, Katelyn Bolstridge, Cymeria Robshaw, Hope Grant, Camryn Rolfe and Emily Herbest and Spanish teacher Michele Cabral will be spending April vacation in Costa Rica immersed in the Central American nation’s culture, exploring the rainforest and more. The students have been busy fundraising for their upcoming journey and the community support has been vital in making their trip a reality. MILO — Next month a half dozen Penquis Valley High School students will be immersed in a different culture and environment, switching from pine tree forests to rainforests, as they spend April vacation in Central America on their “Exploring Costa Rica’s Natural Wonders” trip with Spanish teacher Michele Cabral through EF Education Tours. For most of the half dozen juniors and seniors, the trip will be their first outside the U.S and for each it will be a first-time journey to a tropical climate when they visit the nation of approximately five million located between two oceans April 13-19. The group is scheduled to zipline through the rain forest, take a local cooking class, help in a school, visit natural parks and more. “I’m excited to see a different country,” senior Cymeria Robshaw said. 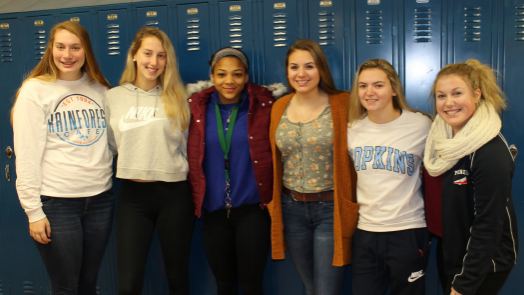 “I’m most excited for the adventure, zip lining and snorkeling,” senior Camryn Rolfe said. “I’m excited to get out of the country and see what the world has to offer and see another country,” junior Hope Grant said. “Since I have been in Maine my whole life I want to see a different ecosystem and different animals,” junior Emily Herbest said. Cabral said this will be the first trip abroad for a group from Penquis Valley in over a decade. She said last year the students, most of whom have taken her Spanish classes, decided they wanted to see a tropical rainforest and experience another culture in person. The per pupil trip cost is $2,680. Cabral said the six have averaged about two fundraisers per month since the end of the last school year and so far have raised about 40 percent of their individual costs. Contributed photo ONE OF THE REGION’S TOP JUMPERS -- Cymeria Robshaw of Penquis Valley soars toward the pit while competing in the triple jump at the Class B indoor track and field state championships last month at Bates College in Lewiston. Several weeks ago Robshaw finished second in the long jump at the New England meet. 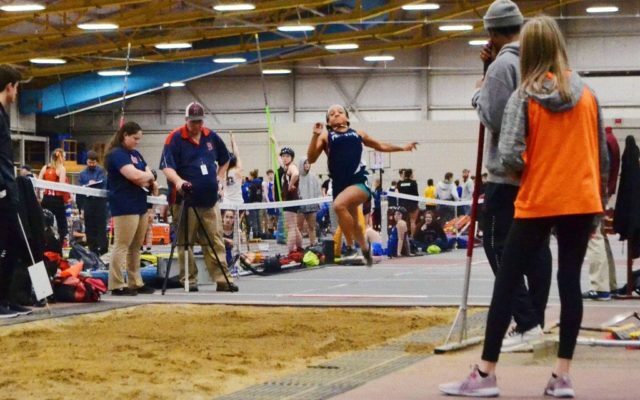 MILO — Penquis Valley High School senior Cymeria Robshaw received a trio of postseason honors on the Penobscot Valley Conference/Eastern Maine Indoor Track League All-Conference Team. Robshaw was selected for the Small School First Team in both the 55-meter dash and the triple jump. She also earned Small School Second Team honors in the long jump. Shop AmazonSmile and help the Brownville Library! MILO — SAD 41 voters heading to the polls on Thursday, March 14 overwhelmingly approved — via a combined count of 152 to 25 pending verification of voting results from the towns — a referendum for a $2.4 million funding package to carry out a heating system upgrade converting from steam to hot water and energy efficiency project at the Penquis Valley School. The referendum was approved in each district community: 7-1 in Atkinson, 55-9 in Brownville, 19-5 in LaGrange and 71-10 in Milo. Atkinson traditionally paid about 10.8 percent of costs and this 10.8 percent of the project would be absorbed by the other three towns based upon the amendment to withdrawal agreement. Atkinson will make a one-time payment of $275,000 to SAD 41 prior to July 1 withdrawal. 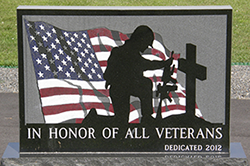 Check out or section dedicated to all local veterans, with pictures of all our local Veterans Monuments. Seating capacity up to 90 plus and various event packages are offerred. High speed Internet available for business meetings as well as listings for caterers, bakers, and lodging for weddings, parties and special events. 03/26 - Timothy A. McDougall Sr.
03/21 - Vernon F. Mudgett Jr.